Summer comes with its own brand of fashion. The weather demands that the fabric, colors and motifs- all reflect the spirit and essence of summer. We at Zuri now explore how summer translates into lehengas. 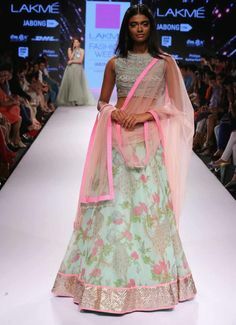 The biggest, most noticeable factor about summer lehengas is the floral cues. Whether it is in terms of print, embroidery, motifs or even borders, a floral touch is one of the most raging trends when it comes to summer lehengas. What’s great is that though the motifs used quite western in their execution, they sit very well with the georgette/chiffon fabric that is used to create this volume. Pick a lehenga with solid color blocks as the choli and lehenga and just drape a beautiful floral dupatta on top to get that perfect picturesque effect. Most other motifs are either flower or mango inspired. Summer colors are simple, pastel and muted. 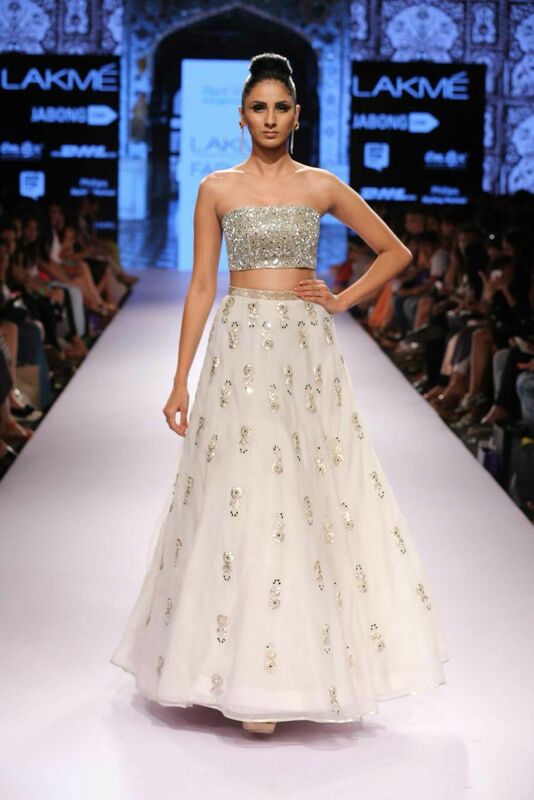 Let your chosen motifs stand out and do the job while wearing an off-white, subdued lehenga. Distribute the much-needed loudness of Indian weddings all across a plain, pastel background. The challenge is to use these colors interestingly. Pick a mint or an aqua instead of a light blue, a steel grey instead of a dull grey and a blossom pink instead of a hot pink so that the motifs are the hero. A quick look at this year’s trends has told us that summer lehengas need not be as full-bodied as the festive winter ones we are generally used to. A style statement is possible even with lehengas which have a lesser body and cleaner, neater cuts. Opt for a silver strapless bodice and a beautiful ivory lehenga with silver studded motifs for a perfect sister-of-the-bride/groom lehenga for a reception party. It’s chic, classy and so totally airy. In short, it’s everything a summer lehenga should be! For the true fashion devotees, Sabyasachi’s T-shirt lehenga hybrids are a class apart. The choli is made to resemble a striped T-shirt and the lehenga is a full bodied floral kaleidoscope. It’s whacky, crazy but so strangely alluring at the same time. This is a great option for a brunch cocktail party during the wedding festivities. Pick your lehenga according to the kind of wedding function and the time of day. If there’s a lot of outdoor activity or dancing (for instance if the baraat will be coming at 12 noon), pick an airy but sophisticated lehenga that will keep you comfortable but chic at the same time. Always remember to try your lehenga on with heels so that you can judge your look perfectly.